13:14 CBugDCoder is there a way to get the exact terain height at a given xz point in lua for mapgens v7,v5,valleys,and carpaithian? 14:52 Megaf IhrFussel: Intel GPU? 14:53 Megaf which mt version? 15:06 IhrFussel If I look at a very specific angle I can see THROUGH nodes? 15:34 Mr-Pardison well, have to hop now. 15:35 IhrFussel Megaf, but are those graphic glitches likely a driver issue or faulty chip?? 15:54 Megaf IhrFussel: so, can't confirm your issue here, does your Minetest shows OpenGL 2.1 too? 15:54 IhrFussel Yep 2.1 ... did you try with the same wood type? aspen wood? 15:56 Megaf whats the block name? 15:58 Megaf do you have shaders active? 16:04 Megaf Are you using the public remote media? 16:08 Megaf FUSSEL< THE HECK THE PLAYERS MOVE THEIR HEADS!? 16:09 Mr_Pardison just spinning their head 'round and 'round without comprehending what's going on. 16:22 MinetestBot Megaf: Could not find anything. 16:26 Megaf why isnt MinetestBot on -dev? 16:26 Megaf and why ShadowBot works here but fails on -dev? 16:26 Megaf and why isnt MinetestBot giving the URL for #6954 ? 16:48 Megaf "As in other professional wrestling promotions, WWE shows are not legitimate contests, but purely entertainment-based, featuring storyline-driven, scripted, and choreographed matches, though they often include moves that can put performers at risk of injury if not performed correctly." 16:50 IhrFussel rubenwardy, server topic = /status? 16:50 IhrFussel You mean in the forums? 16:51 IhrFussel I display a login formspec on each join...could it be enough to add it there? 17:15 CBugDCoder is there a mapgen that would be easier to port to lua? 17:15 CBugDCoder yea maybe and just automatically have it be at y = 0? 17:25 Amaz CBugDCoder: If you send me the code you have for Carpathian, I can have a look at it later this evening, if you'd like. 17:28 Krock 10+1 had a chance again this time..
17:36 ThomasMonroe Krock how do I put a Unicode char into the string for the refresh button? 17:38 Krock Ctrl + C, Ctrl + V, Ctrl + S, test. 17:41 ThomasMonroe what version of Lua is that? 17:45 Krock yeah, got it working with the font "/usr/share/fonts/truetype/dejavu/DejaVuSansMono.ttf"
17:48 ThomasMonroe ugh why am i still getting this: xE2x86xBB? 17:55 MinetestBot Krock: Could not find anything. 17:56 Megaf 2018-01-23 17:56:24: ERROR[Main]: mod "village_canadian" has unsatisfied dependencies: "nbu" "hdb"
17:56 Megaf Sokomine: what's those? 17:58 MinetestBot Megaf: Could not find anything. 17:58 Megaf "If you want to use this village type, get the mm2 modpack from somewhere and read https://forum.minetest.net/viewtopic.php?t=1598"
17:59 Megaf You are not authorised to read this forum. 18:01 Sokomine Krock: the mod "lesssnow" works by adding snow to the world (rl) and providing players with er...those snow-shovels. bonus: there are many many pedestrian walks that can be cleaned of snow! for free! 18:01 Mr-Pardison lunch for me. 18:02 Krock Sokomine, sounds like an amazing idea but then I'd need snow first..
18:02 Megaf 2018-01-23 17:56:24: ERROR[Main]: mod "village_canadian" has unsatisfied dependencies: "nbu" "hdb"
18:03 red-001 Megaf, are you a teapot? 18:03 Megaf red-001: why do you ask that? 18:08 Megaf 2018-01-23 18:08:15: WARNING[Main]: Irrlicht: Performance warning, slow unlock of non power of 2 texture. 18:12 Megaf Isnt it Open Source? 18:15 Sokomine hmm. the init.lua inside nbu states "code CC BY-NC" and "mauvebic gmail.com"
18:38 cx384 Is it possible to output an item with special meta on craft? 18:44 Mr-Pardison will have to get it first. 18:47 rubenwardy what will break if I apt upgrade now? 18:50 Mr-Pardison Megaf: they don't have 0.5 for Fedora yet. Will have to build from source. 18:52 red-001 cause that's a client error? 18:53 red-001 " cause that's a client error"
18:53 Mr-Pardison at least I'll be a pioneer. 18:56 Megaf what does that even means? 18:57 Megaf Can we help it find the way back? 18:57 Mr-Pardison Megaf: where in the folders would it be to start the engine itself? 18:59 Mr-Pardison I've downloaded the engine and the game itself. 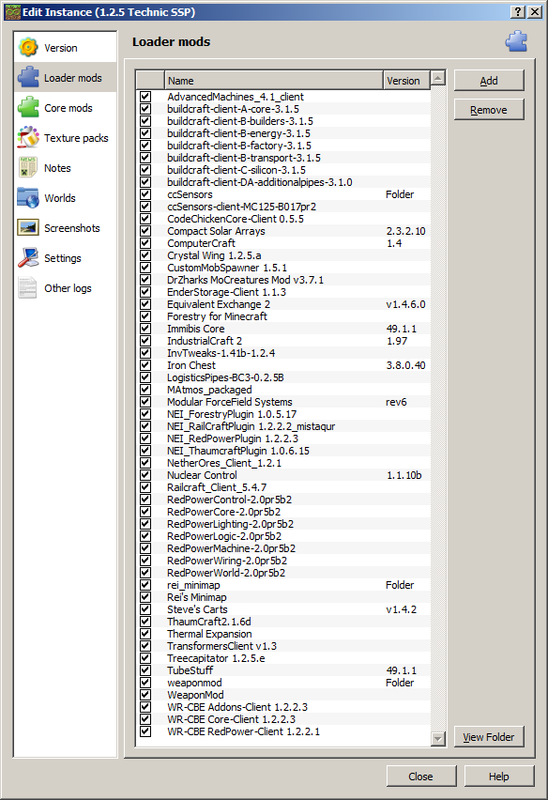 where is file that I use to start the game engine itself is what I'm asking. 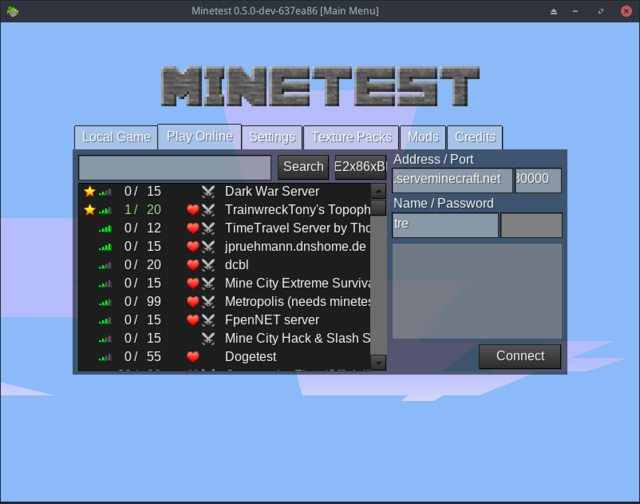 18:59 IhrFussel Mr-Pardison, minetest/bin/minetest ? 19:00 Mr-Pardison IhrFussel: using Fedora for this and am compiling from source. 19:05 IhrFussel Mr-Pardison, did you use git clone? 19:06 Mr-Pardison I downloaded it from the github page. 19:06 Mr-Pardison went through the readme and used the compile commands it has on there. 19:29 Shara Dargod: Please remove my servers from your site. They are not yours and are nothing to do with you. 19:37 red-001 so is this like Voxelmanpl light? 19:39 Mr-Pardison rubenwardy: think that would help with the problem that we are having on RC? 19:39 nerzhul red-001, voxelmanip is for more huge changes i think no ? 19:40 nerzhul do we have a function to get current timestamp ? 19:40 nerzhul or get time in ms or ns ? 19:50 Amaz CBugDCoder: Did you manage to figure it out? 19:52 Amaz The command /surfacey should tell you the surface y at your position. 19:53 sfan5 wasn't there a pr for that? 19:54 Amaz Especially as you have to code a different function for each mapgen...! 19:56 Amaz Will you need functions for other mapgens, or will you just be using Carpathian? 20:00 Mr-Pardison seems they have peers that don't like their connection. 20:25 IhrFussel Shara, I don't think that espteam.org is Dargod's website ... didn't you say they are the hosters of your server? 20:25 Shara It is his. 20:25 Shara Confirmed no one else there has access. 20:25 Shara RC has also split all association with ESP due to Dargod's actions. 20:26 IhrFussel Oh I see so he owns the host service or what? 20:26 red-001 whats the issue? 20:27 Shara The site anyway. 20:27 Shara red-001: I'd rather not bring it into hub any more than I need to. 20:27 Shara But the request to have RC and DL removed fro mthat list has been made elsewhere first, and he's ignored it, so now that request is public for the MT community to see. 20:28 Fixer Megaf: i've joined it and seen weird stones in mid air, incompatibility of villages with mapgen? 20:30 Fixer Megaf: what is your mapgen? 20:49 Megaf whats your max leg with no clients folks? 20:59 Megaf how does it work? 21:03 MinetestBot Megaf: Sorry, I haven't seen hamza56 around. 21:03 MinetestBot Megaf: Sorry, I haven't seen hamza568 around. 21:31 IhrFussel Great the random segfaults I had on my dedi are back on this root server now "Server::SendMovePlayer(unsigned short) bei ??:?" 21:43 Megaf jas_: is that you? 22:03 Megaf I like using both because is "more intensifying"
22:19 ssieb Megaf: The problem happens when the +1 marking has a special purpose in the repo. 22:46 Sokomine what is brown rice? 22:46 srifqi There is brown rice? I only know white rice and red rice. 22:47 srifqi Quick search says that "red rice" is "brown rice". But it is called "nasi merah" (red rice). 22:47 ThomasMonroe anyone wish Visions Of Chaos was open source? 23:14 srifqi Megaf, free red rice? 23:14 srifqi Jordach, I notice that. Beautiful. 23:39 srifqi Gotta go, see you!